The most visible part of Windows Vista is the Aero interface, and while we can't deny that it looks very swish we find it very hard to get excited by a shiny new GUI. Instead, we're looking forward to new Vista hardware, which includes a new use for the humble USB memory key and much, much more. So what will the ultimate Windows Vista notebook offer? Possibly the most dramatic new feature in Vista is Windows SideShow, shown here on the Asus W5Fe which will have an estimated price of £1,399 inc VAT. You shouldn't have much trouble running Vista on any recent laptop, provided it has decent graphics, but if you want to make the most of the new operating system you'll need specific hardware. 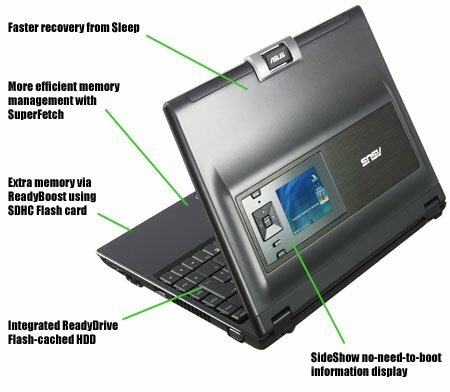 The W5Fe is significant because it's the first Vista-specific laptop to break cover, as opposed to a laptop that can run Vista. SideShow uses a secondary screen and a cut-down OS - which we assume is a form of Windows Mobile - so you can check email, look up a phone number or check your schedule without the need to start Vista. The SideShow screen on the W5Fe measures 2.8in and has a resolution of 320 x 240. It's attached to 1GB of NAND Flash storage which is housed in the lid of the laptop. Asus tells us that the SideShow feature can also be used to display a map as a navigation aid, Google Maps fashion, although that would presumably involve a wireless connection to the Internet. Essentially, what we have here is a PDA built into the lid of a laptop, with the two devices linked together so they can synchronise with a minimum of effort. 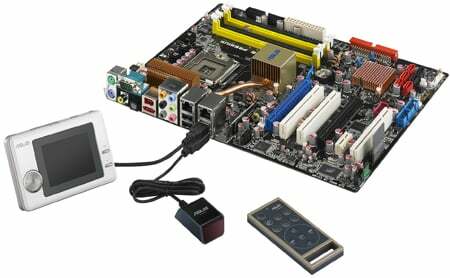 Asus also has plans to offer SideShow as an accessory for its LGA-775 P5B Premium motherboard. As the picture shows, you connect the display to one USB port and a receiver for the remote to a second USB port. No doubt the package will install the SideShow secondary OS to some Flash memory, very likely in the shape of a USB key, which brings us neatly to Windows ReadyBoost - aka External Memory Drive.